The 400MW Dumat Al Jandal project in Saudi Arabia will be built by a consortium of the French energy firm and the Middle Eastern developer after securing a $21.30/MWh offtake deal. EDF Renewables (51% share) and Masdar (49%) submitted the lowest bid to build Saudi Arabia’s first site in a tender process launched in August 2017. The partners out-bid three other groups for the 20-year power deal, including an Engie-led consortium, an ACWA Power joint venture and Enel Green Power. The results of the tender were unveiled in July 2018, but a winner wasn’t named at the time. "The selection of Masdar and EDF to develop the kingdom’s first utility-scale wind power plant is a significant achievement. "Saudi Arabia has set a clear energy strategy to substantially increase the share of renewables in its total energy mix to 10% by 2023," said Mohamed Jameel Al Ramahi, chief executive officer of Masdar. 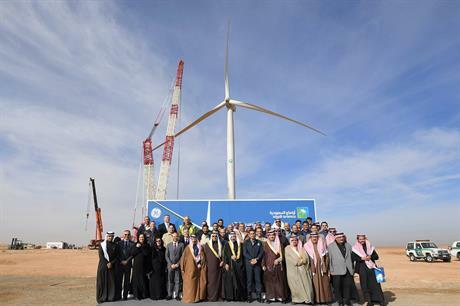 The Dumat Al Jandal project will be the country’s first utility-scale wind site, and the result of the tender comes a year after Saudi Arabia installed its first commercial-scale wind turbine. It will be installed Al Jough, north-west Saudi Arabia and about 900km north of the capital Riyadh. EDF said work on the site could start in a few months.